Hyundai will soon launch its 154bhp Sports Utility Vehicle (SUV) called Santa Fe in India. Hyundai Santa Fe has been given a stylish look from the exteriors and interior.Santa Fe which will be launched somewhere around the end of 2009. The price of the car will be somewhere between 18-22 lakhs in the India. I think Tata also planing some SUV. Any info? Yea a TATA Indicruz .Its an MPV i think. Anyone wanna know more about Indicruz? 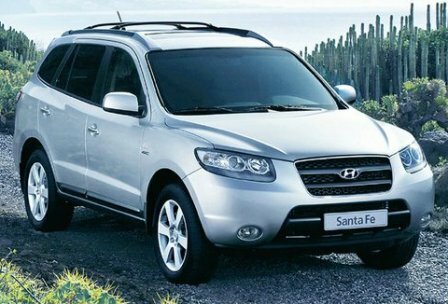 will Hyundai terracan be replaced with santa fe? this car looks great but hyundai has never managed to sell any cars above 10 lakhs in india. sad. yes, i have heard about the indicruz & xover from tata stable & also the new safari. was can discuss about them in a new thread. i think tucson is almost dead now. so it would be wise to replace it. Hyundai Terracan has already been phased out. Tuscon is on the brink of being phased out because of lack of demand. Plus it has very less equipment for its price. The Santa Fe will be a very good buy because it'll offer loads of space, prestige and a good diesel engine. But will this have 4X4? Yes Tucson is almost dead & Terracan is dead already! Santa has got more cool looks but misses the aggressiveness of an SUV! Hyundai Motors India Limited is considering to launch its premium SUV Santa Fe in India next year. Earlier it had planned to import the model as completely built unit but now it does not find it feasible due to 104 percent import duty on CBUs. Instead, the company now plans to assemble model in India by importing it as CKD units. “Yes, we are studying Santa Fe for the Indian market, as premium segment is doing pretty well in the past few years. However, it is still in the investigation stage and we will decide its roll out in the medium term. We have yet not decided whether it would be assembled or imported. But Tucson is not going to get discontinued,” says a senior Hyundai official. The new Hyundai Santa Fe will also be fitted with brand new 2.4L four-cylinder petrol engine to lend it better performance and make it competitively priced in India. The car will compete with Honda CRV and Maruti Suzuki Grand Vitara. The company will take a final call on the car after assessing its feasibility in the Indian market. The car is expected to launch in India by mid-2010. This is a good looking SUV. Hope they price well and increase the competition. I dont think Hyundai is strong enough to compete in SUV segment! I would say it will be good if they concentrate on Sedans more than SUV. They tried to fight the SUV war with the Tuscon and no one noticed. They should introduce new sedans to get a grip on the market and then get the SUV's rollin' . You missed the Terracan, The car was good but a flop like Tucson. I've seen the Santa Fe on Roads in Delhi and in Auto Expo as well, I would say it can be a good competition for vitara, Hyundai should not price it above 15 lakhs. Oh the Terracan. See I missed it, just like the Indian people! 15 lakhs? Shouldn't be much of a problem for Hyundai! No, i cannot compare Terracan & Tucson!